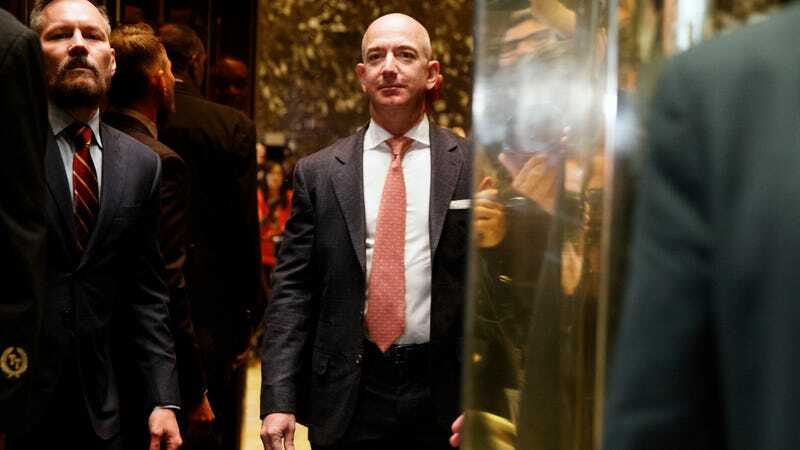 Jeff Bezos, Amazon CEO, Washington Post owner, and Blue Origin founder, had a pretty good Thanksgiving this year per Bloomberg, which estimated this week that Black Friday sales on Amazon had put him over the $100 billion personal wealth mark. As CNN Money noted, the Black Friday sales reports led to a 2.5 percent increase in Amazon stock price, thus meaning Bezos gained around $2.4 billion in one day alone—enough on its own to qualify the Amazon chief as one of the 1,000 richest people on the planet. While Bezos has continued to accumulate wealth and Amazon has become the single most important e-commerce company with the possibility of cornering nearly half of all U.S. online retail sales, their dizzying success has come with concerns the company is simply too powerful and should maybe be broken up or you know, regulated. Stories of a brutal, competitive workplace culture at the company’s corporate offices and distribution centers are common, and it increasingly relies on a small army of competing contractors with few labor protections to make many of its deliveries. At this point, Amazon is capable of crushing competitors by merely indicating it is moving into their business. Some people may question whether it’s a good thing for society that one individual and his holdings now control such a massive swathe of the American economy. But hey, can’t make $100 billion without breaking some eggs.